Meet Manager for Swimming is the most widely-used swimming management software in the world. There are thousands of HY-TEK customers using Meet Manager in over 100 countries and our system has been used in several Olympic Trials, Junior Olympic Trials, and national meets, as well as in tens of thousands of local meets worldwide. Meet Manager for Swimming offers you comprehensive solutions for every aspect of organizing a meet, making sure that not a drop of water is out of place and you spend more time by the pool instead of behind a computer. Meet Manager for Swimming offers a pool full of features that have been specifically designed to make running your meet easy and efficient. The swimming software features a comprehensive online help resource, a meet entry import tool, a meet results export tool, full data access from the Run Menu, and support for an unlimited number of records and time standards. Plus, reports are brilliantly designed and give you the flexibility to translate every word and phrase into virtually any language, which can be exported into multiple formats. With Meet Manager’s unique Run Menu Scoreboard, you are front and centre on all the action, with full control over each event and heat. All the information you need is on your screen, allowing you to make instant changes and additions. Quickly manage DQ’s, scratches, late entries, relay names, awards, judge’s decisions, results and more. Note: Meets must be running on Meet Manager 4.0 or later, and must have an internet connection. Reward your athletes and give them a sense of accomplishment! Easily print award labels for any event or heat, tailored to the size you select. These labels will ensure that you have professional ribbons to present for 1st/2nd/3rd place, Personal Bests, Standard Achievers and more. Stay organized and know who’s who by printing labels or cards listing the entries for your meet (seeded or unseeded). The INTERFACE also includes a Meet Event Download feature which allows you to download event numbers and descriptions directly into the timer. This saves you hours of time that would normally be spent manually keying event information into your timing console. The INTERFACE is also capable of importing and displaying relay take-off reaction times, streamlining your swimmers’ data even more. Keep your audience captivated! The Scoreboard INTERFACE transmits start lists and event results from the Meet Manager database directly to the computer controlling the alphanumeric scoreboard. Quick as lighting, valuable information that swimmers and parents want to see is prominently displayed. HY-TEK interfaces with the following alphanumeric scoreboards: Colorado Time Systems, Daktronics, Omega and IST. If your club does not use any of these systems, there is a generic scoreboard function which exports the data in a format that enables any scoreboard computer to receive and parse the information for display. The generic scoreboard interface works with Lynx Developer’s ResulTV software which can drive any scoreboard, including video boards. 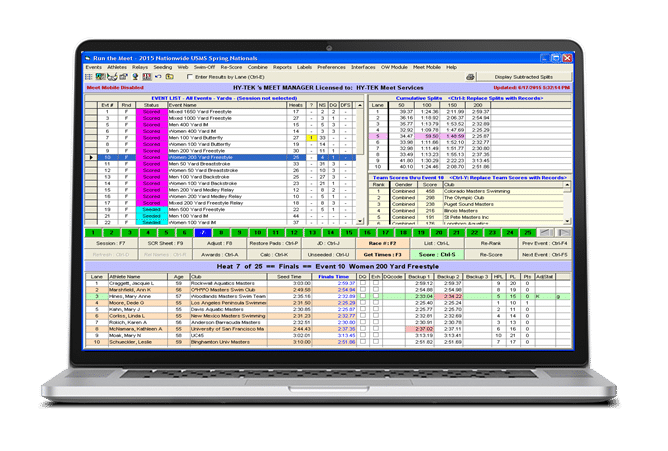 With the new Meet Manager Pro Network option, administrators, coaches and officials have access to one central database that stores every piece of information. No more hassles trying to find information that is scattered among different databases and files! As multiple people operate on various PCs to keep the meet running, all information is “networked” so you can be sure that each piece of data is stored in and shared from one location, increasing accuracy and efficiency. Assign permission levels to each user-with four levels to choose from, you can easily retain control over who has access to what. The Meet Manager Pro Network Option also includes the ability to upload current heat and event results directly to a website in HTML format. Provide real-time meet results directly to the host club’s or swim organization’s website so parents, coaches and swimmers can watch the meet in progress. With the Button Finish Interface, you can bring your system out in the open! Results for Open Water races can be imported into MM’s Open Water module from seven brands of button timers, one brand of stopwatch, and FinishLynx photo finish. For the order of the finish, the OW module offers the option to scan competitor’s waterproof barcodes or to manually enter the order of the finish to match the imported times. The upgrade price for MM 6.0 is $149.00 for Customers who ordered MM 5.0 for the first time or upgraded to MM 5.0 after April 1, 2015. The following features all require the Meet Manager Start Up. Probably 98% of Meet Manager products are licensed to the School or Club that is hosting the meet at their facility and are in the meet. There is no additional fee for this School/Club License. This is our most popular License option and allows a Club, Team, or School to run any meet that is HOSTED BY (at their own pool) and COMPETED IN by that club, school, or team. For example, if MM is licensed to Central High School, the software may be used to run all of the home dual meets at Central High School as well as any invitational meets that are sponsored by and participated in by the Central High School Swim Team. Please note that a club and school team must have their own license even if they swim at the same site and have the same head coach. Additionally, and as an example, if the software is licensed to a YMCA or USS club, that software cannot be used to run a College or High School meet even if some members of the club are competing in the College or High School meet. This License option allows the software to be used to run one specific championship meet each year. A typical use of this License option would be to run the State Championship meet that is rotated among different high schools each year. If the software is licensed to a League’s Championship Meet, that software may NOT be used to run the Dual Meets or Divisionals for that league. Having a Championship Meet license requires the Licensee to submit via email to sales@hy-tekltd.com the date of the meet each year. When this information is received a web download will be emailed to the Licensee for that year. If a CD is needed a product replacement should be purchased through our online store. When a license is being upgraded, a CD will be sent at no charge for that order. A facility may want to order MM and use it for any and all meets that are run at the one facility – Age Group, Masters, High School, College, etc. However, the site licensed software is not to be distributed to entering teams to facilitate their data entry. The Site License option requires an annual subscription fee. A swim Organization may want to order MM and use it for up to a maximum of four (4) Championship meets ONLY. An Organizational license may not be used for club or school hosted meets. An example of an Organizational License might be for a Province or State running their 3 or 4 provincial or state championship meets. The Organizational License option requires an annual subscription fee. The single user software may NOT be distributed to run separate meets at separate sites for subsets of one organization. For example, if there are four district meets advancing to a state championship, this requires five licenses unless one of the districts is also running the championship meet in which case four licenses would be required.